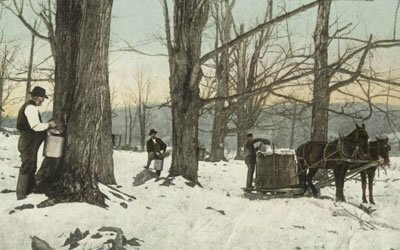 This presentation examines the many meanings of maple sugaring. Maple is enormously important to Vermont’s economy, ecology, and heritage. Champlain College professor Michael Lange will discuss sugaring ethnographically, based on over five years of research among sugarmakers all over the state, to learn from them what sugaring really means to Vermont. Rather than discussing the practical aspects of sugaring, such as how to tap a tree or how an evaporator works, his talk focuses on how and why maple has become so important to Vermont’s identity, and how and why it helps us shape who we are as Vermonters. Reading Historical Society’s annual meeting will precede the talk. “Brinner” or Breakfast for Dinner will be served including pancakes and maple syrup.